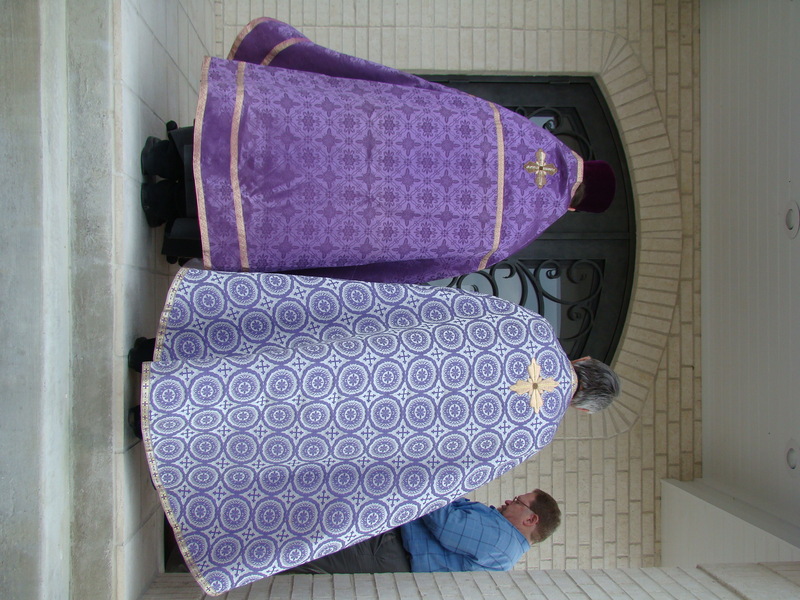 I’m posting some photos and video below of last Saturday’s road trip to All Saints Orthodox Mission in Victoria, Texas. I was not prepared for how obvious and visible the new church was from the highway. I was looking for the big water tower – a handy landmark when you’re trying to find the church – but it was the starkly white and unusually shaped (for Victoria) church building that got my attention. You just can’t miss it as you drive into town on Hwy. 87. As I posted last time, Victoria has never had an Orthodox church. It has a large percentage of Roman Catholic churches, but mainline Protestant and non-denominational are equally present. There’s even been a Muslim mosque for several years, but never an Orthodox church. 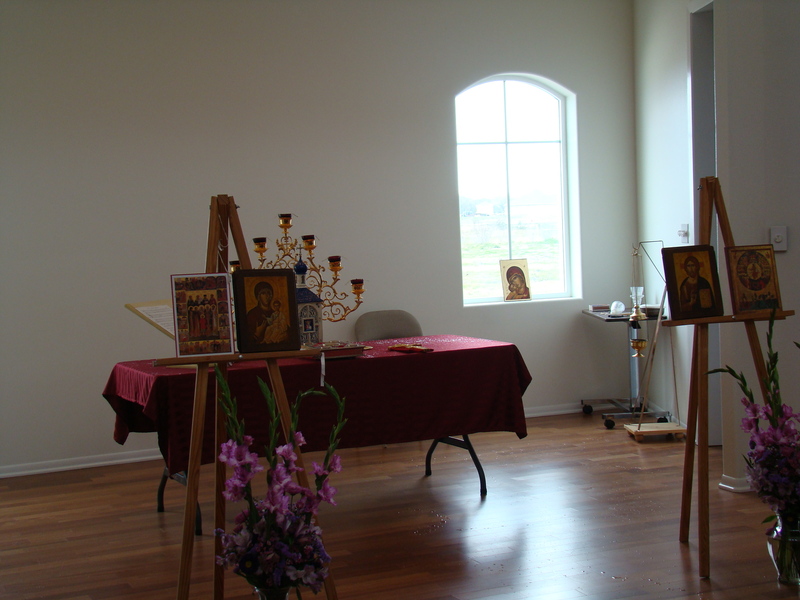 Corpus Christi, 50 miles away, had the closest Orthodox church. Can you spot the small water tower near the church? This was about 10:30 a.m. as folks started to gather outside. By the time the service started I’d guesstimate there were close to 75 or 80 people there, including several Protestant clergy and a photographer from the Catholic Diocese of Victoria. Lift up your gates, O ye princes; and be ye lifted up, ye everlasting doors, that the King of Glory may come in. The Lord storng and mighty, the Lord, mighty in battle. Lift up your gates, O ye princes; and be ye lifted up, ye everlasting doors, that the King of Glory may come in. Below is a clip of Fr. Dimitri at this point in the service. It was a pretty windy day and you can barely hear the exchange described above. After entering the temple, Fr. Dimitri blessed the interior with holy water. Now I’m sorry I didn’t get more pictures, but the interior is something else. 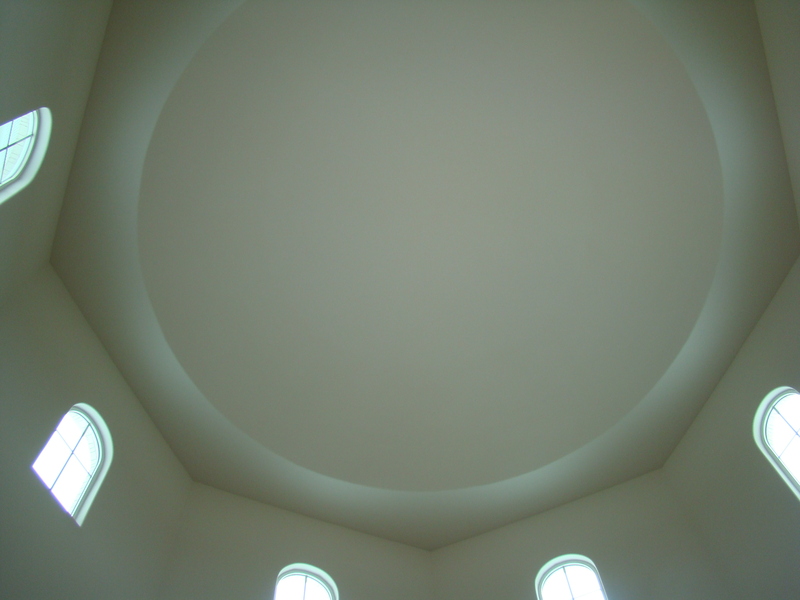 The nave is semi-circular with side areas that will be perfect for adding more space on crowded days. The doors separating the narthex and nave are huge glass double doors, that when combined with all the clear windows in the church and the windows around the dome, make the church feel almost like it’s outdoors. The floors are stained concrete and the altar area is floored with the most satiny smooth exotic hardwood. All I can say is the finished effect is simply beautiful. 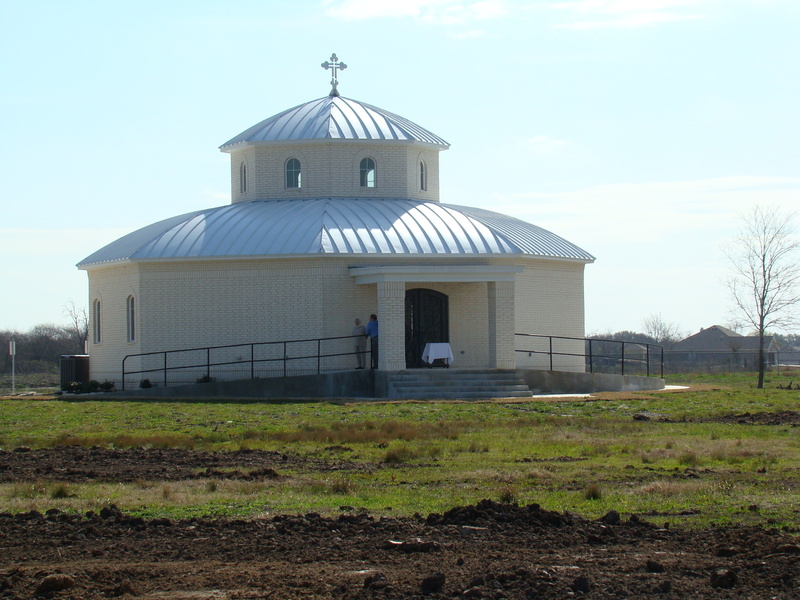 Once the iconostas is in place and the iconography on the walls and dome, then this will be an example of the very best in “modern” Orthodox church architecture. The parish catered a wonderful meal by a local Greek restaurant (sorry I just can’t remember the name of the business). Despite the wind and the cool tempertures it turned out to be a perfect day. God is blessing this mission in so many ways and I pray for their success in this life and the next. This entry was posted on March 11, 2010 at 7:17 am and is filed under American Orthodoxy, Orthodoxy in the News. You can follow any responses to this entry through the RSS 2.0 feed. You can leave a response, or trackback from your own site. Please contact Elias about the beautification of your church. Elias’ work is really beautiful Angela, but since I’m not a parishioner of All Saints, I can’t give my 2 cents about who they hire to do their inconography.